This week I have been busy making nut mixes! Some of my nuts sell quickly, while others, though loved by many, just don’t sell as quickly. The fast and slow sellers came to a pinnacle after last weekend and I had to hustle to get them all made to restock. The first step to making the nuts is creating the extra special secret coating. Besides coconut oil, which I talked about a few weeks ago, there are two other oils that I rely on for the nut coatings and other products. Here is a little about them. When we first started eating grain free we had to take a very close look at the ingredients we used regularly to cook, which included oils. Whether frying eggs, making salad dressing or making marinades, we needed to keep our fats grain free. This meant excluding commonly used oils like canola oil, corn oil and soybean oil. Extra Virgin Olive Oil and Avocado Oil were two oils that we always loved and were joyfully able to continue using. There are four recognized types of olive oil: extra virgin, virgin, refined and olive pomace. While the production process is the same, the difference between extra virgin and virgin is the acidity level, with it being twice as high in the virgin at 1.5%. Refined olive oils are made with virgin batches that are too acidic and have been filtered with charcoal or other filters, but no solvents added. Olive pomace is a mix of refined and virgin oils, resulting in a more neutral flavor and higher smoke point. It is often used in restaurant commercial cooking situations. Extra virgin olive oil is high in Vitamins E and K, as well as oleic acid, which gives the oil anti-inflammatory properties. Some studies have likened the anti-inflammatory effects comparable to Ibuprofen. We only use the extra virgin type of olive oil in Grain Free Haven products, taking advantage of the high quality, slightly pungent, nutty flavor for savory recipes. The coating of Momma’s Mixed Nuts and Pecans, as well as the Cajun Cashews include extra virgin olive oil. It is also used as the fat in Jalapeño Cheddar Muffins. To me avocado oil has a buttery taste, just like the fruit they are made from, so I like using it in recipes to give the end result a hint of butter, while keeping them dairy free. It is made by using a centrifuge to separate the flesh, oil and water, then a separator is used to refine the oil. It is crazy high in Vitamin E and a mono-unsaturated omega 9 fatty acid called oleic acid. Besides helping reduce inflammation, these elements help reduce gassiness and bloating while also improving digestion. Grain Free Haven products like Chocolate “Cinn” Cashews, Banana Bread Muffins and Blueberry Lemon Muffins all include Avocado Oil. The flavor seems to do really well in sweeter dishes, so that is typically where were we use it. This delicious Argentinian sauce is packed with the healthy benefits of extra virgin olive oil or avocado oil, and the parsley will add loads of vitamins and antioxidants to whatever dish to which it is added. It is also addictive so you may need to make a double batch! Roughly chop parsley, including stems. Place them in a glass bowl or jar. Add garlic, salt, lime and oil. Stir or shake up the ingredients until the parsley is coated. Heat up the bacon grease and chopped bacon until it is hot, then drop bacon into bowl and drizzle grease over the mixture. This step will wilt some of the parsley and release flavor and aroma. 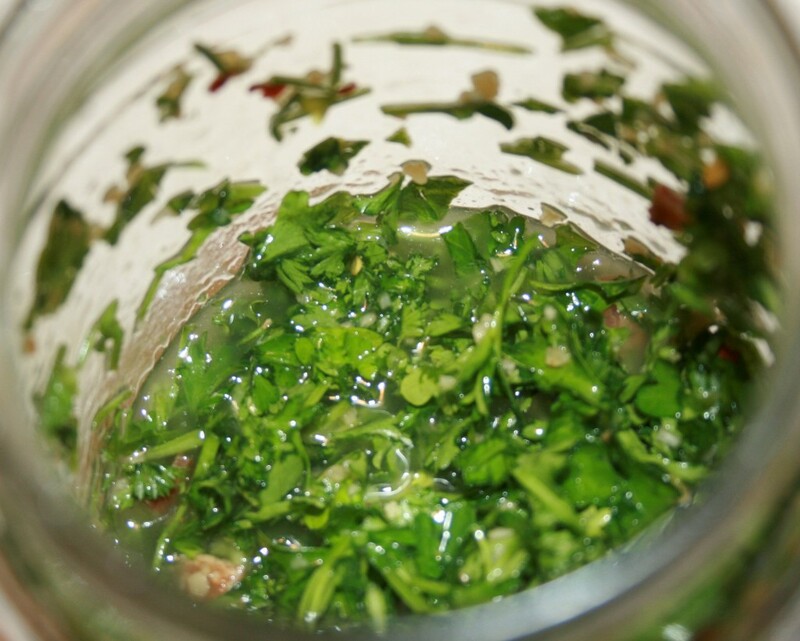 Place chimichurri in the fridge for at least four hours. To serve, remove from fridge at least one hour before serving to allow the oil and grease solids to liquefy. Serve over steak, fajitas, roasted vegetables or use as a dipping sauce. Saturday, March 5, 2016, 8am-5pm: Dallas Farmers Market. We are so very glad you like our Power Bread, Buns and Breakfast mix (all Paleo compliant)! This week we will have plenty ready for you so we don’t sell out before you arrive. We also restocked our nuts, especially Momma’s Mixed Nuts and Pecans, including new crop pecans from our market vendor friends at Lampmans Pecan Company. Sunday, March 6, 2016, 10am-5pm: Dallas Farmers Market. As a special treat this weekend we are offering our Strawberry Shortcake Muffins! As spring gets nearer we know you are longing for those delicious Texas strawberries, and these muffins won’t disappoint! We will continue to also have our decadent Peanut Butter Chocolate Chip Cookies and sugar free, dairy free Coconut Macaroons!